Batching or settling is a process by which a merchant sends their authorized transactions for the day to their acquiring bank for payment. It is important to submit a batch settlement every 24 hours in order to qualify your transactions at the lowest discount rate offered by your bank processor. There are two parts to every credit card transaction - an authorization and a settlement. Both functions must be performed in order to complete the transaction and receive the funds in your bank account. A new screen will show, listing all transactions that have been authorized but not settled. Click on the check box next to each transaction listed, and click the Submit for Settlement button at the bottom of the screen. TIP: You can settle a transaction for less than the amount authorized. When viewing the list of transactions available for settlement, you will notice a column on the right-hand side that says Settlement Amount; you may change this amount to be anything up to the amount authorized. You cannot settle a transaction for more than the authorized amount, but you can issue an additional authorization for the added amount you wish to charge. If there are more than 20 transactions available for settlement, you will be shown the next page of transactions available for settlement. Repeat the step above as needed to settle all authorizations. NOTE: If an authorization is older than 21 days, you will not be able to settle the authorization. See Expired Authorizations for information on how to settle these transactions. You can view all transactions you've marked to settle by going to Virtual Terminal > View Pending Batch. You will be shown a list of all transactions that are marked to settle and will be included in that batch. You have two options when you are viewing transactions to be settled. You can either submit the transactions you've checked off to be settled, or you can skip the entire page and go to the next page. Note that if you click Skip to Next Page, none of the transactions you've marked will be submitted for settlement; they will be skipped over and not placed into the batch. You should only use the Skip to Next Page button if you are certain that you do not want to settle any transactions on the page displayed. If you would like to only settle a few transactions out of the ones listed, check only those transactions you wish to settle and click Submit for Settlement. All merchants have a default Batch time of 2 AM EST; this is when transactions are sent out for settlement. If this time conflicts with business hours (say, transactions come in after that time and the business doesn't close until later) then the merchant can set up to 4 custom batch times at a different time of day or night. You may only choose to batch on the hour (no 'odd' times) and you may not batch from 5AM-8AM EST. This is a processor restriction. A selection of times will appear with checkboxes next to each time. 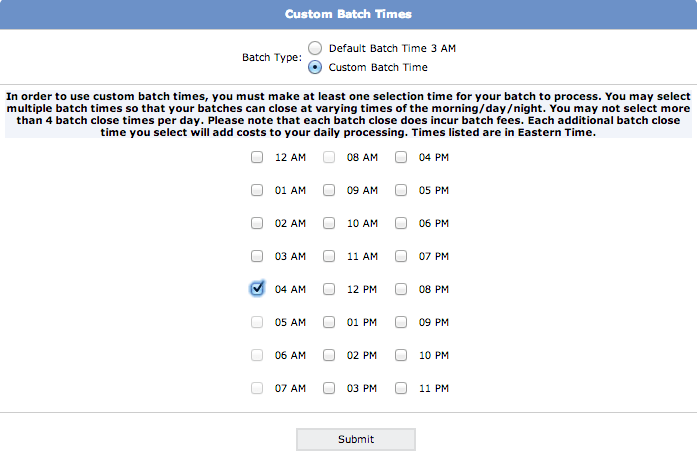 You may select multiple batch times so that your batches can close at varying times, but you may not select more than 4 times per day. Remember, each batch close incurs batch fees. Note: This affects the time transactions are sent out and therefore will affect the time funds are received. There is a fee for every time that a batch is submitted, no matter what!